To advance our understanding of the ongoing effects of spotted wing drosophila in host crops, we have produced impact statements for the 2012 and 2013 growing seasons. Our 2012 Impact Statement was developed by surveying entomologists throughout the eastern United States about their state-level observations, and our 2013 Impact Statement summarized the results of a national stakeholder survey. To determine the effects of SWD during the 2014 growing season, we again conducted a national survey of stakeholders, using the same form as during 2013. Surveys were made available online and at grower meetings. Surveys at grower meetings were conducted from January 9 through March 8 2015. The online questionnaire was made available at the eFly SWD Working Group website and emailed as a link to grower email lists, grower organizations, and cooperative extension agents. Online responses were collected from December 11 2014 through February 13 2015. A total of 436 individuals responded to the survey; 144 respondents completed paper copies at grower meetings and 292 filled out the survey online. Survey respondents were from at least 31 different states (Figure 1); four respondents declined to provide their location. Figure 1. Number of respondents by state, combined online and paper surveys. Four respondents declined to provide state information. In addition to representing 31 states, responses were widely distributed geographically (Figure 2). The largest number of responses came from southern states (42.8%), followed by western (24.4%), Northeast (17%), and Midwestern (14.6) states. Figure 2. Regional distribution of responses. 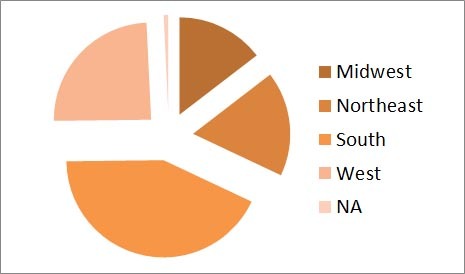 Regions corresponded to those used by Regional IPM Centers (http://www.ipmcenters.org/). Demographic information in addition to state was collected from respondents to the online survey, and of those, 56.5% were conventional fruit growers, 13.5% were organic fruit growers, 9% were extension agents or specialists, 2.9% were crop consultants, 4.8% were homeowners, and 13.5% were engaged in other activities or did not provide demographic information. Demographic information beyond state was not collected on paper surveys as all respondents were growers. In contrast to 2013, the majority of respondents (52%) grew only one SWD host crop, although a large number of respondents still grower than two host crops (Figure 3). Figure 3. Number of SWD host crops grown per respondent. The majority of respondents grew blueberries, followed by strawberries, raspberries, blackberries, grapes, and cherries (Table 1). Respondents represented a substantial portion of US blueberry, blackberry, and raspberry acreage. Table 1. 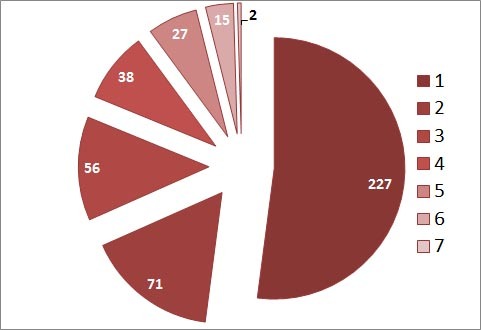 Spotted wing drosophila host crops grown by respondents. *Acreage totals by crop were from the 2014 USDA NASS Noncitrus Fruits and Nuts Summary (blueberries, raspberries, strawberries, cherries, grapes) or 2012 Census of Agriculture (blackberries). The average, minimum and maximum reported percentage loss across all responses for each crop was calculated (Tables 2-7). In addition, average loss by crop was calculated for each state with more than two total responses and compared to the value of each crop within a state. Crop values for each reporting state were obtained either from the 2014 USDA NASS Noncitrus Fruit and Nut Preliminary Summary, January 2015 when available, or estimated based on reported acreage in 2012 Census of Agriculture and reported crop value and yield per acre from the 2014 USDA NASS Noncitrus Fruit and Nut Preliminary Summary. Potential crop losses were also calculated based on the total value of a crop within reporting states with greater than three respondents and the average percentage loss observed across all states. In the case of blueberries, blackberries, raspberries, cherries, and grapes potential losses were higher than observed losses. However in the observed losses for strawberries was higher than averaged potential loss, due to particularly high loss percentages in some states (Table 5). When totaled across all crops, the estimated crop loss due to SWD experienced in the crops and states represented in our survey was $133,309,400. The potential national crop loss due to SWD based on 2014 average damage is $1,276,992,028. Table 2. Estimate crop loss due to SWD in blueberries, 2014. *Values calculated based on reported acreage in 2012 Census of Agriculture and crop value ($1.71/lb) and yield estimates (5970 lb/acre) from 2014 USDA NASS Noncitrus Fruit and Nut Preliminary Summary. Table 3. Estimated crop loss in blackberries due to SWD, 2014. *Values calculated based on reported acreage in 2012 Census of Agriculture and crop value ($2.11/lb) and yield estimates (8720 lb/acre) from 2014 USDA NASS Noncitrus Fruit and Nut Preliminary Summary. Eastern yield estimates in research trials range from 18,000 to 20,000 lb/acre, so values are likely conservative. Table 4. Estimated crop loss in raspberries due to SWD, 2014. * Values calculated based on reported acreage in 2012 Census of Agriculture and crop value ($2.05/lb fresh) and yield estimates (10,020 lb/acre) from 2014 USDA NASS Noncitrus Fruit and Nut Preliminary Summary. Table 5. Estimated crop loss in strawberries due to SWD, 2014. * Values calculated based on reported acreage in 2012 Census of Agriculture and crop value ($156.74/cwt fresh) and yield estimates (82.89 cwt/acre) from 2014 USDA NASS Noncitrus Fruit and Nut Preliminary Summary. Table 6. Estimated crop loss in cherries due to SWD, 2014. * Values calculated based on reported acreage in 2012 Census of Agriculture and crop value ($1.01/lb, sweet cherries; $0.48/lb tart cherries) and yield estimates (98200 lb/acre sweet; 2280 lb/acre tart) from 2014 USDA NASS Noncitrus Fruit and Nut Preliminary Summary. Table 7. Estimated crop loss in grapes due to SWD, 2014. * Values calculated based on reported acreage in 2012 Census of Agriculture and crop value ($0.38/lb) and yield estimates (14800 lb/acre) from 2014 USDA NASS Noncitrus Fruit and Nut Preliminary Summary. We further compared the effect of farm size on reported crop loss across all reporting growers (Tables 8-13). In general, small farms experienced higher crop loss than larger farmers across, and small farms were also more likely to experience 100% crop loss due to SWD than were larger farms. At least one blueberry, blackberry, or raspberry grower reported 100% crop loss, but no strawberry, cherry, or grape growers reported total crop loss. This suggests that SWD damage may be more severe in blueberries, blackberries, and raspberries than in the other reported crops. Table 8. Reported percentage crop loss in blueberries by farm size. Table 9. Reported percentage crop loss in blackberries by farm size. Table 10. Reported percentage crop loss in raspberries by farm size. Table 11. Reported percentage crop loss in strawberries by farm size. Table 12. Reported percentage crop loss in cherries by farm size. Table 13. Reported percentage crop loss in grapes by farm size. Table 14. Input increases associated with spotted wing drosophila summarized by crop. Note that growers were asked about input increases across their entire farm, not for individual crops. Categories with fewer than two responses are indicated by -. Respondents were also given the opportunity to include comments. Frequent comments expressed a desire for better insecticides but also for ways to reduce the amount of insecticide needed, through improved materials, better application methods, or non-chemical controls. Several commenters indicated that damage on their farm was less severe in 2014 than in 2013, but they also indicated that they have reduced losses as compared to previous years through increasing pesticide use and labor, as reflected in the responses summarized in Table 14. More stakeholders completed the 2014 impact assessment survey than in the previous year, 436 compared to 249. This high response rate underscores the continued significance of SWD for berry and tree fruit growers. Despite some grower comments that SWD losses were lower in 2014 than in 2013, the average percentage crop loss reported increased for all host crops (Table 15). Table 15. Average crop loss reported in 2013 and 2014 impact assessment surveys.